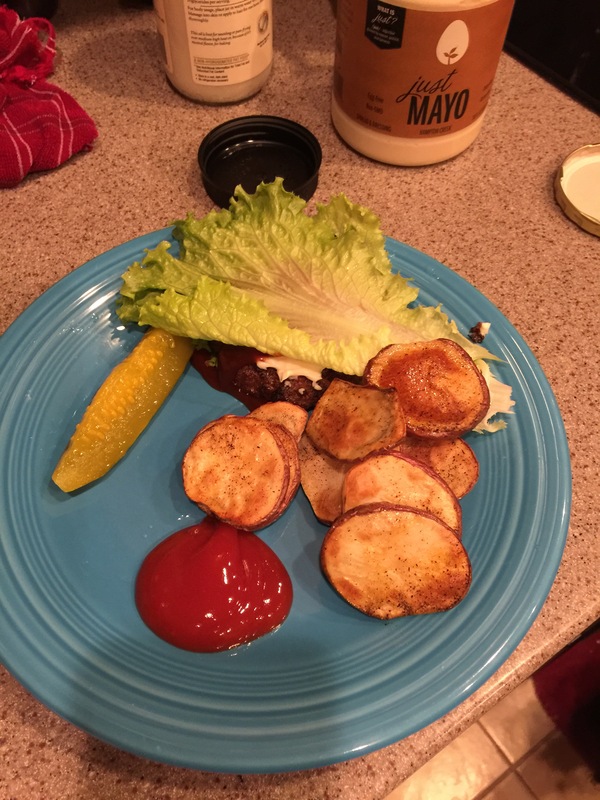 Whole 30 6-11… I’m still on the bandwagon! So here is the deal… it’s going pretty darn good. I mean don’t get me wrong I am not loving every moment of it, BUT, i’m still going strong. I was so excited to write about my experience!! I felt like this would help me have more accountability and also give me something to look forward to. But as it turns out, life gets busy and as usual, my writing gets fewer and farther between. I will try and catch you up to speed! Here’s the deal…Breakfast every single day is eggs/bacon/sausage in some capacity. Sometimes its a boiled egg, sometimes its a fried egg, but you get the idea. Eggs every morning! Notice the “Just Mayo” above. That is paleo friendly and it works for the whole 30. I have used this instead of regular mayo anytime I need it for tuna or whatever! Super yummy, more expensive, but you honestly cannot taste the difference at ALL! And the potatoes– look yummy, right? I used salt and pepper, olive oil, and threw them in the oven on 400 for 30 minutes. DELISH!! 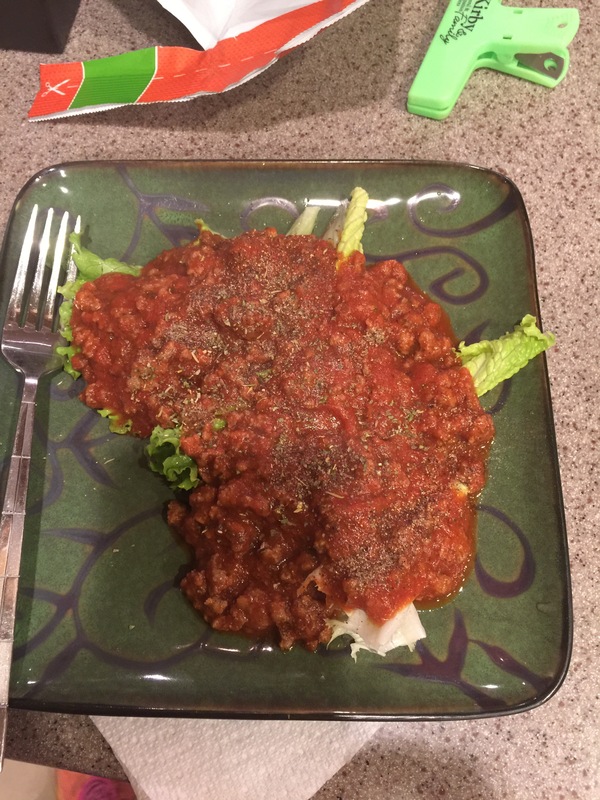 Now my spaghetti… I found all of these Whole 30 compliant recipes but i’m gonna be real here. I used regular, sugar free, spaghetti sauce from a can. I work, I have a family, and I have done DANG good on this thing… i’m not making my own. Sorry! SO, technically I screwed up but I ain’t even sweating it! It was yummy and I didn’t have the noodles so… I’m calling this another successful dinner. I miss Stevia in my hot tea. I drink a cup every evening while I watch tv and I miss it. I am still not used to the bitter taste of tea without it. Black coffee isn’t terrible… but I miss creamer! Olive and vinegar as a dressing is amazing! I may never buy dressing again. I can’t tell a difference in anything when I substitute coconut oil. It’s expensive but this may be one of the take aways I keep using longer after these 30 days are up. My husband has no interest in participating in this challenge… EVER! 🙂 However, everything I have made that was strictly Whole 30, he has loved. For the rest of the week I will repeat things I have made before. The tacos were amazing and you can find that recipe here and you can read that post here. I enjoyed the sausage and shrimp dinner that I made previously. (Check that out by clicking here. ) I love tilapia and we haven’t had that in a while so I will probably bake that in the next few days. It’s quick and easy and the ONLY thing that will be different I won’t be adding butter to my potatoes. 🙂 When I only have to make a minor change that makes me SUPER happy!!! Worst part– snacks! I am tired of fruit. Isn’t that sad? I will get over it but I could so go for a bowl of popcorn right now. 19 days left! I CAN do this. And more importantly I WILL do this!